The Everglades is a wetland biome spanning about 2 million acres of southern Florida. It's a largely undeveloped natural oasis surrounded by human development, including the cities of Orlando, Fort Lauderdale and Miami. The Everglades area is famous for its diverse wildlife, but monkeys are not included in the roster of indigenous creatures. While monkeys don't live in the Everglades, lots of other mammals do. The Florida panther is arguably the most exotic mammalian resident in these wetlands. 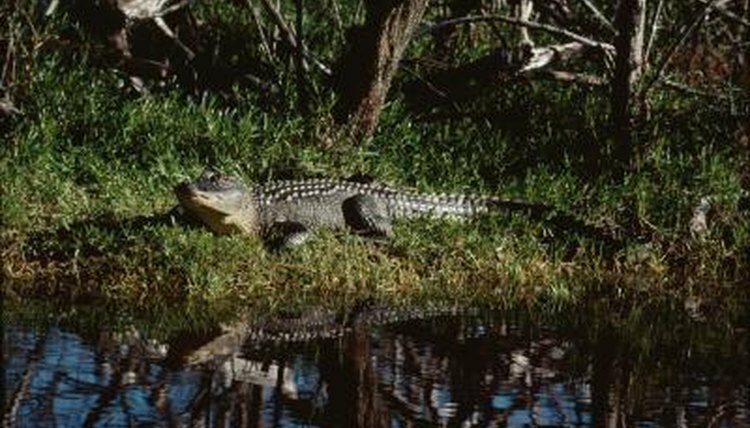 They're endangered, with only an estimated 10 to 15 currently living in the Everglades. Manatees, though water-bound, are another famous mammal found in the Everglades. You're most likely to spot one in the area during the winter months. Other mammals in the area include black bears, otters, raccoons, deer and grey foxes. Florida is well-known for its American alligators, plenty of which can be found dwelling in the Everglades. It's not as well known that American crocodiles also reside in these wetlands. The green anole is a small lizard that has a chameleon-like ability to change between green and brown. The Everglades is also home to numerous species of turtles, frogs and snakes. The water moccasin and diamondback rattlesnake are two of the more dangerous snakes found in the habitat. More than 350 bird species -- including many wading birds -- call the Everglades home. Some of the notable types include great blue and the little blue herons, bald eagles, anhingas, ospreys, white ibises, sand hill cranes, roseate spoonbills, egrets, wood storks and woodpeckers. Florida and the Everglades are both infamous for their mosquitoes, too, and the area also hosts countless types of insects and arachnids, including more than 90 kinds of butterflies. Of course, these wetlands also feature an amazing array of plant life, including cypress, mangrove and pine trees, along with wild orchids and all sorts of other flowers. Monkeys aren't indigenous to any of the 50 United States. North America in general isn't home to any of these primates, except for part of southern Mexico. Monkeys live primarily in subtropical and tropical regions of Central America, South America, Africa and Asia. Most reside in trees in lowland areas of these places. However, their habitats are diverse, with different species residing in forests, rain forests, savannas, scrublands, steppes, mountains and on islands.